In 2011, the UK Census included a question about national identity for the first time. That is, the extent to which people self-identify in relation to a nation. The results showed the growing salience of Britain’s identities: Scottish, Welsh and English. Yet these identities are experienced differently by Britain’s different migrant and ethnic communities. 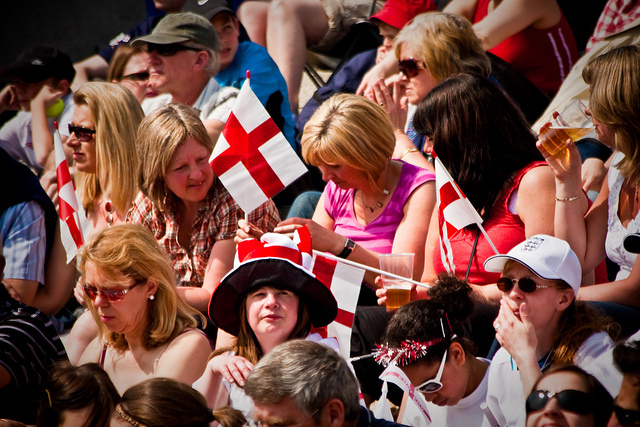 As another St George’s Day comes and goes almost unnoticed, perhaps we would do well to consider how and why we experience Englishness so differently. In England, Englishness is now the predominant national identity, expressed by nearly two thirds of the population (66%), as opposed to the 58% who identify themselves with Britishness. In 2013, Englishness was stronger than Britishness across all age-groups, social classes and genders with one important exception: England’s ethnic minorities. In fact, if we focus on the BME population, only a quarter identify as English. It is Britishness, rather than Englishness, that is the national identity of choice among migrants and minority ethnic populations, particularly those of South Asian and/or Muslim origin. On the whole, respondents from Black and minority ethnic groups in England are much less likely to claim an English identity than their white counterparts and tend to align themselves with broader notions of Britishness. This is particularly strong among naturalising British citizens. In the process of citizenship acquisition a person becomes formally British. Even if their new nationality does not translate to a recognised British identity in informal and everyday situations, their official status at least legitimises their legal right to claim that identity. Englishness, on the other hand, does not offer such opportunities. Englishness is an informal identity. The English do not have a passport, they do not have their own state, and they do not have a naturalisation system. So, can naturalising British citizens become British and English, and if so, how? Although 40% of new citizenship applicants describe feeling English/ Welsh/ Scottish/ Northern Irish “a lot”, there is a wealth of quantitative and qualitative research to suggest that ‘Englishness’ does not speak to migrants and ethnic minority groups but is, in fact, predominantly the preserve of white Anglo-Saxon Englishmen and women. According to sociologist Michael Skey, many white English identifiers consider themselves the ‘proper English’, in contrast to non-white and immigrant Britons in England. This self-assurance, he suggests, gives these Britons a stronger sense of ‘privileged belonging’ in England. This division between the ‘proper-English’ and ‘new-British’ is one that is recognised both within the white Anglo-British population and beyond it, evidenced in the work of Leddy-Owen, a sociologist at Portsmouth University. Following ethnographic research on the extent to which English identification is racialised (i.e. perceived or experienced in a racial context), Leddy-Owen finds evidence that Englishness is implicitly coded as a white, ethnic identity. St George’s Day celebrations, Trafalgar Square, London. By Garry Knight. At the same time, BME Britons, like Sajid (a British-born man of South Asian heritage in London), feel unable and are unwilling to identify as English, which they consider closely associated with whiteness. “Ultimately”, Leddy-Owen explains, “Sajid feels that skin colour and a categorisation as non-white means that he can only be considered as ‘like’ the white English rather than ‘naturally’ white English”. Despite recognising that there is little cultural difference between himself and ‘the English’: “The colour of my skin, my ethnic heritage, [encouraged me to feel] that I was so far away from being embedded in this [English] culture when actually I’m complete-, very much embedded in this culture…” Sajid never identifies himself as English. Nor does he believe that that his daughter will identify or be identified as English. As Leddy-Owen puts it, “white skin remains the key boundary of Englishness”. A gross misunderstanding of the realities of racialised Englishness among white Englishmen and women “who argue[d] passionately and seemingly with great conviction in favour of the principle that English identities should be open to anyone” is evidenced in Leddy-Owen’s work. A few years ago, amid Diamond Jubilee celebrations and London Olympic preparations, Labour leader Ed Miliband expressed admiration and appreciation for the multi-layered and multi-national identities that are possible in modern Britain. “Britain is”, he claimed, “a country where it is always possible to have more than one identity. More than one place in mind when you talk of home”. According to Miliband, the country is, and should be, based on plural identities. But, are all identity combinations equally possible? Since the start of the Union, national identity in the United Kingdom has always been multi-layered, combining national and infra-national identities. However, despite this fact (and Ed Miliband’s optimism), it is clear that for some people even the simple combination of Britishness and Englishness is experienced precariously. Add to this dual national identification, identification with ‘Other’ nation-states beyond the UK, Europe and/or ‘the West’ and things only become more difficult. Statistics can only tell you so much and qualitative research does not always stick – being too easily passed off as exceptional and anecdotal. Sometimes you have to experience it, or at least hear it first-hand. For me, the problem was hit home most strongly last year when one of my students described how her mother told her as a child that as a black girl she was British but would never be English. I’ve read similar stories several times but hearing it first-hand from a young woman, born in England to British-born parents, educated and preparing to step out into the world of work, was different. And her black classmates agreed. In fact, the accepted understanding among young black British females (in the non-representative sample of my classroom) was that black people are not, and never will be English: Englishness, as they see it, is the preserve of white people and white places. Whether this is a problem or not is up for debate. Migrants and minorities certainly have high levels of identification with Britishness, so do they need Englishness too? Would it in fact be more useful if Englishness remained the domain white English people, redefined as an ethnicity, rather than national identity – and what would happen to our sporting allegiances then? Whatever position one takes on the matter, one thing seems clear. Englishness is not experienced evenly, nor is it equally open to all people in England. With some scholars and public figures advocating resurgent Englishness (albeit a more inclusive Englishness), it is crucial that any strengthening of Englishness, to the detriment of Britishness, occur alongside increased inclusivity. In the UK, where people can have overlapping or nested national identities, it is considered best to understand national identities as existing on a spectrum, extending from exclusively English to exclusively British. As such, these respondents were able to select multiple identities (Wyn Jones, 2013). Interestingly, this is different to survey results in Scotland and Wales, where BME respondents have often preferred the ‘local’ national identity. A massive 87% of new citizenship applicants described feeling British (and 58% “a lot” British) in a recent survey, compared to 29% of white Britons! Richard Wyn Jones, Guy Lodge, Charlie Jeffery, Glenn Gottfried, Roger Scully, Ailsa Henderson and Daniel Wincott (2013) England and its two unions: The anatomy of a nation and its discontents, London: IPPR.